Superstar Salman Khan has booked Eid 2019 as the release date of his next film, 'Bharat'. The 51-year-old star will play the title role in the movie, which will be directed by Ali Abbas Zafar. 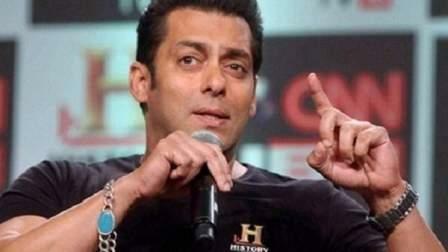 With 'Bharat', the actor is continuing with the trend of releasing his films on Eid. The movie will be shot on elaborate sets in Abu Dhabi and Spain, besides Punjab and Delhi in India. The movie is an official adaptation of 2014 South Korean film, 'Ode to My Father', which narrates modern Korean history from the 1950s to the modern day through the life of an ordinary man and events such as the Hungnam Evacuation during the 1950 Korean War. 'Bharat' will be backed by Atul Agnihotri, who attended the South Korean film's screening at Berlin Film Festival, where it was identified as potential content for the Indian masses. Agnihotri says their adaptation will be inspired by the original movie but the story will be based closer to home. "It's the journey of a country and also a person, both of whom go by the name of Bharat. The actor-producer duo's film will hit the celluloid on the festive period once again post the blockbuster 2011 'Bodyguard'. "It's a character that I thought would resonate with him. It's a huge responsibility making a film with Salman as there are big expectations that come with the job. "I'm very conscious about Salman's fan base and what they want. And once again, I'm convinced that being a family film it's worthy of coming during the festive time. And anyway, an Eid release is always every producer's preferred choice." Salman has worked with Zafar in 2016's blockbuster "Sultan" and their much-awaited film 'Tiger Zinda Hai' up for release on December 22.